NOTE! This product was discontinued at the end of 2017. If you need to link a site via a RF channel, have a look at Digital Repeater Backhaul. This post will remain, usque ad consummationem saeculi, as a reference. In some situations you may come across a system where one or more high sites provide the desired coverage but do not have IP connectivity to the rest of the network. This may be due to no internet connectivity on site or nearby; no microwave link back to another site (100%+ Fresnel zone obstruction) or no possibility to install IP equipment on site. For IP Site Connect systems, there is now a fairly simple solution which a colleague has tested and successfully demonstrated it. The solution was not really intended for this but we have seen that it works and that it can solve the problem I've described above. The Vertex Standard EVX-Link is a DMR-Radio-to-IP link that allows you to link sites, via EVX5300/5400 mobile radio, and an IP link. Now if we co-locate two mobile radios on one site, we could provide a two way RF link between two locations - in this case two repeater sites. The below drawing illustrates this better: Site A is part of the IP Site Connect system and has IP connectivity with the Master and the other Peers. Site C does not have any connectivity because Site B prevents you installing a microwave link; and because the location of Site C is very remote. You would install the EVX Site Link, I will describe below, on Site B. Site A has IP connectivity whereas site C has none. The link is at site B. The setup for the EVX Site Link is as follows. The Yagi on the left would point to Site A. The Yagi on the right would point to Site B. The radio connected to the Yagi on the left would be programmed for the frequencies of the repeater on on Site A and so forth. Both radios should be set for low power to prevent de-sense or other RF issues. The two Mobiles+EVX Links can be separated as the connection between them is Ethernet. There are also some configuration possibilities such as repeater-to-repeater or radios-to-repeater (note the frequencies). does the EVX links act as a transparent DMR bridge ? meaning the clients connected to repeater C shows up like they are connected to Repeater B ? Basically just expanded coverage. or does this mean we get IP connection to the DR3000/SLR5500 repeater in site C trough this ? Yes, the EVX-Link is transparent to all over the air traffic: call IDs; text;data etc. The link management traffic that repeaters normally send over the IP link is not supported however. Does that mean that applications like trbonet watch or rdac cannot connect to repeater A and C in this example? i think the applications connect directly by IP and not via the master repeater. Since the repeater at Site A is part of the IPSC network, it will be accessible to RDAC etc. Site C will be operating as a stand-alone repeater. How can the EVX System Link that is show in figures above handle both TS since terminals can only be registered in a single TS ? Does this mean that for simultaneous use of both TS, i will need the duplicate the EVX System Link ? When configured with the EVX-Link, the mobile will relay the data/voice/control signals on both slots. So it will pass both slots simultaneously - one radio for both slots. How about Talk Groups? How many TGs repeater to repeater EVX Link will pass? In MOTOTRBO, I can program one TG per channel on (mobile) radio. The EVX link is Talkgroup agnostic. Sorry, but my english isn't perfect. Did I understand right: EVX Link, between repeaters, will pass through as many Talk groups, as many I programed in my fleet? And repeater C (in picture) will be part ( peer ) of IPSC system? Yes, all groups will be passed to repeater C. BUT repeater C can not be monitored using tools like RDAC; SmartPTT Monitoring or TRBONET Watxh - no IP conection to this site. Or in other words EVX-Link is a RoIP Gateway? Is this can be connected to DM4600/DM4601 mobile? Does MOTOROLA have similar product for DM4600/DM4601 mobile? Can I connect SLR/DR and EVX via IP port and then link them by Vertex radios whose is connected to EVX, instead of MW links. Thanks for all the info. Could I also use this solution for extending a single repeater Link Capacity Plus site? Or will this only work for IPSC? 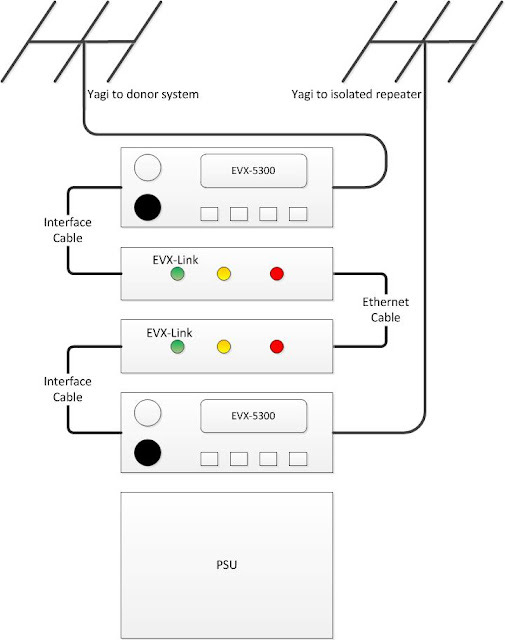 If I have more than one repeater on a LCP site would I be able to use multiple EVX systems (I guess one EVX system per repeater) to extend the complete site? Will this also work with capacity max? Hi. No, this should not be used for Linked Capacity Plus or Capacity Max. This will only work on conventional systems. This is a great idea. Wayne, my thought is to use this for coverage extension with a conventional repeater. Would putting one of these in a town that has poor fringe coverage be appropriate? I assume it would operate as a bi-directional repeater of sorts? Yes, that would be possible and it work pretty well. If I understand correctly if imposed a system EVX links (like your example in the figure) passes only TS1 or I can get the two TS same time? As I understand it, both slots can be passed but only in a repeater-to-repeater configuration. In a simplex(radio)-to-repeater configuration, only one slot can be passed at a time even if the radios on the simplex channel support DCDM. *** Comment replies were reposted due to an error. I ran some tests with Evxlink but in radio EVX 5300 I can program only one frequency and a Ts1 . First of all, thank you for sharing this solution. We have tested this it has an extended cell. 1- Voice quality is not has good has a native Motorola solution. 2- There is a considerable delay between RX of Radio A and TX of radio B. 4- It can only be used one TS per kit. 5- It can only be used in a simplex mode. With half duplex the radio searches for a base station to register and fails to transmit (don’t know if there is any workaround this issue). #5 sounds like a configuration problem. #2 could be down to network latency and packet scheduling. And the biggest problem is It can only be used in a simplex mode - half duplex mode, when both radios are transferred in half duplex mode communication between the two repeater is impossible. Does anybody have the same problem and knows a solution? Thank you, nice greetings from Croatia. Je viens d'acquerir 1 DR300 avec 5 DP4601 pouvez-vous me proposer un exemple de configuration du relais numérique DR. I have just acquired 1 Motorola DR300 Repeater with 5 DP4601 can you offer me an example of configuration of DR single site. Mich würde Interessieren ob es Möglich ist Repeater-System 1 (2 Repeater 147 MHz) mit EVXLink und Repeater-System 2 (3 Repeater 155 MHz) mit einander zu Verbinden das EIN Netz entsteht? In beiden Netzten sind die Funkgeräte mir Privatkey Verschlüsselt. für die vorteil die nicht-Deutsche leserschaft, ich werde auf Englisch beantworten. The EVX-Link can be used to link two different IPSC systems together, irrespective of frequency. If the MOTOTRBO radios are using privacy, there should be no problem since the EVX5300 also supports enhanced privacy - but not basic privacy. Is it likely that Motorola Solutions will now make this product compatible with the DR3000/MTR/SLR repeaters since they now have officially taken over VS. Love to hear your comments. My understanding is that the EVX-Link is to be discontinued. The EVX-Link only works with an EVX-4500 (which is also going). There might be residual stock so try placing an order. You could also use voting if there is receive (outbound) coverage in the dead spot - this works really well.